Missouri mother is being charged with stealing and using the Pain medication suggested for her terminally ill child. According to authorities, officers were dispatched to a doctor’s workplace on Monday, Sept. 10, where they uncovered issues of neglect and substance abuse related to a young 20-year-old woman who is terminally ill and is supposed to be receiving hospice care. Police later learned her mother and main caregiver, Carol Ballweg had apparently not been supplying fentanyl and oxycodone prescribed for the woman’s discomfort. Police said personnel at the physician’s office had made previous “hotline” calls relating to the woman’s care and said there were concerns about Ballweg’s ask for the prescriptions to be filled sooner than needed. With the suspension from the staff, they asked for the daughter’s urine sample for screening. A drug screen exposed no signs of the recommended medication in the 20-year-old lady’s system, and at that time, her prescriptions were no longer filled. Cops made contact with DHSS private investigators, who stated they had likewise gotten problems from the woman’s house health company regarding the medication concerns. 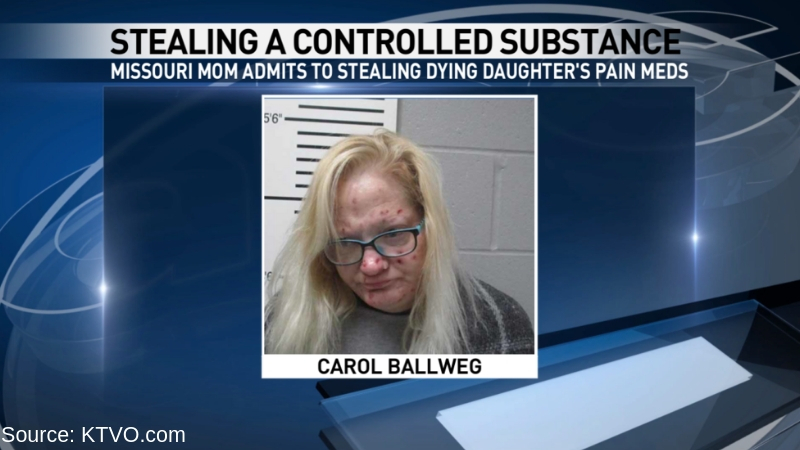 A search warrant was performed at Ballweg’s home on Sept. 11, and at this moment, police stated Ballweg admitted to being addicted to opioids and confessed to taking her daughter’s medication and using it herself. She’s been charged with four counts of taking a controlled substance and 2 counts of abuse of an elderly, disabled or vulnerable individual. Money bond was set at $100,000, and Ballweg was ordered by the judge to have no contact with her daughter.